Mail and Empire, March 18, 1933. Missing from this list of chowders is the kind you might expect: clam. The first printed recipe using the term, published in Boston in 1751, reads like poetry. One of the few pieces on celebrities to slip into the M&E’s women’s pages so far during our look at them. Norma Shearer did not appear in any films during 1933, returning to the screen in Riptide in March 1934. As for her two-year-old son, Irving Thalberg Jr. grew up to be a philosophy professor. Mail and Empire, March 20, 1933. Bride Broder’s moaning about late winter weather in Toronto is not a recent development. Let’s embrace spring and make some fresh lemonade syrup. Mail and Empire, March 21, 1933. A double-dose of Ann and Katherine for you, heavy on desserts and sweet treats. Mail and Empire, March 23, 1933. A suggestion to create community gardens in poor areas of the city in the midst of the Great Depression. Note the nod to The Ward, a historical Toronto neighbourhood which has been the subject of much research and reexamination in recent years. Mail and Empire, March 24, 1933. These days, pigeon is not a meat you can easily walk into a supermarket to buy. And it’s not a dish that gets much publicity. But modern recipes can be found, such as this one from Jamie Oliver’s site. A quick Googling also found that contraptions similar to today’s featured utensil exist, even though I’ve never seen one in action. Mail and Empire, March 17, 1933. I’m going to guess that, much as now, much of the “gay doings” Ann Adam expects around St. Patrick’s Day involved consumption of copious amounts of alcohol. This may partly explain why the Mail and Empire‘s morning competition, the Globe, barely mentioned the occasion at all. The Globe‘s owner, William Gladstone Jaffray, refused to run ads for alcohol even after prohibition ended in Ontario in the mid-1920s, and I can’t imagine him endorsing any articles remotely celebrating drinking. Since this article encourages readers to tint their party pleasing foods green, I checked if green beer was a thing in 1933. According to Smithsonian magazine, the practice dates back to the early 20th century, but didn’t catch on widely until the 1950s. Mail and Empire, March 16, 1933. In Search of England came out of a series Morton wrote for the Daily Express in 1926. It is an account of a journey around England in a Bullnose Morris, written ‘without deliberation by the roadside, on farmyard walls, in cathedrals, in little churchyards, on the washstands of country inns’. Its tone is jaunty, as the narrator leaves London and reels at whim in his two-seater down country lanes and past historic sites in search of an essential and timeless England. It is a quest to find in reality the England that existed as myth for a war-ravaged generation; the village at dusk, smelling of woodsmoke, surrounded by green fields; the thatched cottages and rambling gardens; the time-worn historical monuments. This was the land ‘worth fighting for’ in the propaganda of both world wars. That Morton apparently found it, many times over, in the course of his travels (reaffirming it in every new edition), reassured readers that it really was out there, even if it might not be visible to those living in cities or their ever-expanding suburbs. What Morton demonstrated to his predominantly urban readers, with a deceptively casual air, was that this England – the ‘real’ England – was just a car journey away, down an inviting and empty country road. Morton moved to South Africa in 1948, just as apartheid was being implemented in that country, a political direction that didn’t seem to bother him. Toronto Star, March 17, 1933. As for what the other Toronto papers had to offer for St. Patrick’s celebrations, the Star published recipes for Shamrock Cake and Mint Jelly. The Star also published a photo of an unidentified baby wearing a St. Patrick’s Day hat. I couldn’t find any references to a St. Patrick’s Day parade happening in the city. More digging reveals that processions that day ended in 1877, and did not resume until 1988. Public processionals of Irish identity — or at least Irish Protestant anti-Catholic identity — were reserved for the Orange Parade on July 12. According to the July 13, 1933 edition of the Globe, 50,000 people marched across municipalities throughout Ontario to mark the 243rd anniversary of the Battle of the Boyne. Dignitaries and Orange Lodge officials addressing these gatherings declared their allegiance to the British Empire and denounced atheism, bilingualism, and Communism. In Toronto, where 10,000 people marched, the parade went from Queen’s Park to a rally at Exhibition Park. In front of attendees such as Mayor William J. Stewart and Premier George Henry, participants denounced what they believed was an “organized effort to make Canada a bilingual country” by criticizing French language instruction in schools and radio programming. Mail and Empire, March 6, 1933. Merriam-Webster defines “waltonian” as “of, or relating to, or having the characteristics of Izaak Walton or his writings on angling.” So referring to the 17th century author of The Compleat Angler in the headline makes sense for Ann Adam’s fish-centric menu. Question about the “mock rabbit” recipe: What would have been considered “grated Canadian cheese” back in the 1930s? Would this have been processed cheese the home chef would have grated themselves, a packaged product similar to grated cheddar or Parmesan we generally associate with pasta, or something else entirely? Seriously, a quick Google search digs up plenty of recipes for Rinktum Diddy aka Rinktum Ditty, which Merriam-Webster defines as “a mixture of tomato sauce, onion, cheese, egg, and seasonings served on toast.” The origins of the name appear to be unknown. As of 2019, Parkers Cleaners continues to provide Torontonians with cleaning services. This marks the first appearance in this series of “Woman’s Point of View” columnist Bride Broder, the pen name of M&E women’s page editor Mary White. More on her in a future post. 1933 Mail and Empire Women’s Pages 2: Happy Marshmallow Day! Mail and Empire, March 3, 1933. While March 3 did not catch on as a national observance celebrating the wonders of marshmallows in Canada, you can celebrate the toasted version of this sugary treat every August 30! Also, hands up whoever has seen “mm” as shorthand for marshmallow in a recipe. After indulging in all those marshmallow recipes, a basket of vitamin-rich food may be required. It may also be a quiet reminder that winter was nearing its end, and fresher vegetables were not far away. “Do You Know This Utensil” was a weekly feature which introduced handy products for any 1930s kitchen, such as this dust pan which saved the day for any klutzes who dropped ingredients for their appetizing hot bread on the floor. Note the presence of Rice Krispies in the last recipe, which were still a relatively new product when this paper was published. Introduced to store shelves in 1928, their mascots Snap, Crackle and Pop made their advertising debut in 1933. It was several more years before the recipe for Rice Krispie Squares/Treats was unleashed on the public. And now, a few words from our sponsors. Four suggestions for celery-based soups. The title plays upon the notion of celery as a nerve-calmer, which had resulted in numerous celery-based drinks marketed around the turn of the 20th century. One of the few modern survivors is New York deli staple Dr. Brown’s Cel-Ray. I’ve tried it several times and haven’t enjoyed it (this from somebody who loves old school sodas like spruce beer). I understand the concept and how Cel-Ray could pair nicely with some form of cured meat, but I suspect I’d be happier if there was a salty, pickle-based drink. It’s doubtful that Loblaws will revive its short lived mascots Cash and Carrie for the chain’s 100th anniversary this year. As gossip is “the child of laziness” that is “adopted by people who don’t think,” what weighty matters of the world shall we discuss while sticking a fork into a piece of tuna and celery souffle? Aside: if any of you are tempted to try any of the recipes featured in this series, let me know. Send pictures, reviews, etc. I wasn’t kidding when I said last time that underweight children were going to be a recurring advertising concern. As funny as this ad seems with its bizarre-looking nutrient deficiency crook, child malnutrition was a serious concern during this era. As for the radio stations which carried the “VIP Broadcast,” both evolved into today’s CBC — CKGW (named after its owner, Gooderham and Worts) is the ancestor of today’s CBLA, while CKNC (run by the Canadian National Carbon Company) would become CJBC. Author Jamie BradburnPosted on March 3, 2019 Categories newspaper history, women's pagesTags 1930s, ann adam, aunt jemima, cbc radio, celery, ckgw, cknc, fish, food, katherine kyle, loblaws, mail and empire, marshmallows, radio, recipes, vip, women's pagesLeave a comment on 1933 Mail and Empire Women’s Pages 2: Happy Marshmallow Day! During a research dive into the pages of the Mail and Empire while preparing this article, I wound up collecting two months worth of women’s pages, which I figured might make an interesting ongoing series for this website. The paper had a rich history of covering women’s domestic affairs and social issues stretching back to Kit Coleman’s pioneering work during the 1890s. Caricature of Izaak Walton Killam, Maclean’s, April 1, 1933. In 1933, the Conservative-leaning Mail and Empire was Toronto’s largest morning paper, ahead of the Liberal-leaning Globe (the Star and Telegram, both of which had larger circulations, battled it out for evening readers). It was owned by Izaak Walton Killam, one of Canada’s richest businessmen. In keeping with his shy, modest persona, Killam tended to keep out of the editorial staff’s way. Mr. Killam lives in Montreal and is a perfect example of what once was known as the financial magnate, a species rendered almost extinct by the glacial action of frozen assets. He has a power company in Calgary, a chocolate concern in Halifax, a newsprint enterprise at Liverpool, Nova Scotia, and a good deal of trouble with all of them. He also owns a newspaper in Toronto called the Mail and Empire, and has hoped some day to own the Globe as well. A great many people has wondered why in the world he bought the Mail and Empire, and are even more puzzled as to what a man would do with two newspapers, especially two Toronto newspapers. [Note: the two papers were united as the Globe and Mail by George McCullagh and William Wright in 1936]. He does not speak at all unless he has to. He is nearly always tired. He is nearly fifty, wears blue suits, carries a yellow stick, and has romantic brown eyes and a complexion that makes him look slightly in need of a shave. He made a strict rule some years ago not to be interviewed or photographed by the press, and has had little difficulty about this during the last couple of years. In spite of the inconvenience which frequently results, he is disposed by nature to be friendly with people. For more on Killam, check out an episode of CBC Radio’s Ideas series which covers his life, and the philanthropic legacy he left, including scholarships and a lot of money for the Canada Council. Mail and Empire, March 1, 1933. Future posts will discuss the identity of “Ann Adam,” so for now let’s dive right into the table talk about food. The main feature was a series of “ethnic” meat recipes. Understanding of non-European dishes was slowly evolving, as was the bastardization of meals inspired by exotic locales. In 2019, little screams “Mexican” about that meat loaf other than tomatoes. Next was a lecture from a series sponsored by Consumer’s Gas, which spends today stressing the importance of meal accessories. The lectures were held at the Consumer’s Gas Showroom, an art deco-influenced architectural gem built two years earlier. Some cookie recipes to get you through your late winter malaise. A brief word from our sponsors. Underweight children will become a recurring advertising theme. A mixture of features here, including a spinach recipe, a cutesy cartoon, and an update on a social service organization. Finally, a syndicated cartoon which ran across North American throughout the 1920s and 1930s. Toronto World, February 19, 1919. “When the hour of final rest comes, when my eyes close forever, if I may pay myself this tribute, this simple tribute of having contributed to healing a single patriotic wound in the heart of a single one of my compatriots, of having thus advanced, as little as may be, the cause of unity, concord and harmony among the citizens of this country, then I will believe that my life has not been entirely in vain.”–Wilfrid Laurier, 1887. On February 17, 1919, Toronto’s morning newspaper readers were informed that Sir Wilfrid Laurier’s health was declining following a series of strokes. Regardless of political affiliation, the early papers wished Laurier a speedy recovery. The Globe (Liberal-leaning paper), February 17, 1919. Mail and Empire (Conservative-leaning paper), February 17, 1919. Toronto World (“independent” Conservative leaning), February 17, 1919. Yup, Mackenzie King will never lead the Liberal party. Toronto Daily News, February 17, 1919. By the time the evening papers hit the streets of Toronto, Canada’s seventh prime minister (and then current leader of the opposition) was dead. Toronto Star, February 17, 1919. Among the tidbits the Star included was a column listing 30 titles Laurier had held during his life, from the federal seats he represented to numerous honorary degrees. You may have noticed that the Telegram hasn’t been mentioned yet. Unless there was a special edition published which was not microfilm, the paper had very little to say. Given the rage the Tely had shown Laurier over the years, especially during the 1917 federal election, this isn’t surprising. Over the next few days, there was little about Laurier’s passing in the Telegram. February 18’s front page editorial cartoon was about the League of Nations, while the following days returned to the usual gripes about local issues, politicians, and rival newspaper publishers. On the editorial page, Laurier isn’t mentioned until the fourth item, via a tribute which attacks his anti-conscription stance in 1917 by mentioning the sacrifices of those who died during the First World War. It was probably written by editor-in-chief “Black Jack” Robinson, one of the angriest, hyper-imperialist editorialists in Toronto history. Evening Telegram, February 18, 1919. The Globe, February 18, 1919. 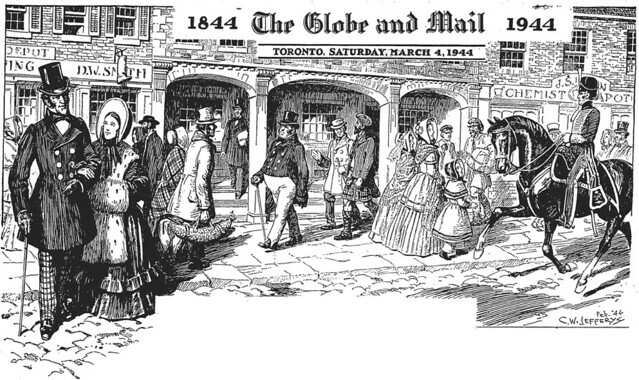 If the Telegram attacked, then ignored, Laurier, the Globe praised his career with many pages of tributes. One article even praised his love of children. Mail and Empire, February 18, 1919. Toronto Daily News, February 18, 1919. Toronto World, February 18, 1919. Toronto Star, February 18, 1919. The Star published numerous tributes from local dignitaries ranging from Chief Justice of Ontario Sir William Meredith (“he possessed to a remarkable degree the confidence of a century”) to University of Toronto president Sir Robert Falconer (“his personality was most charming”). As with the passing of any major figure of the era, poems, such as this one by cartoonist J.W. Bengough. The Globe, February 21, 1919. Mail and Empire, February 22, 1919. Additional material from Wilfrid Laurier by André Pratte (Toronto: Penguin, 2011).